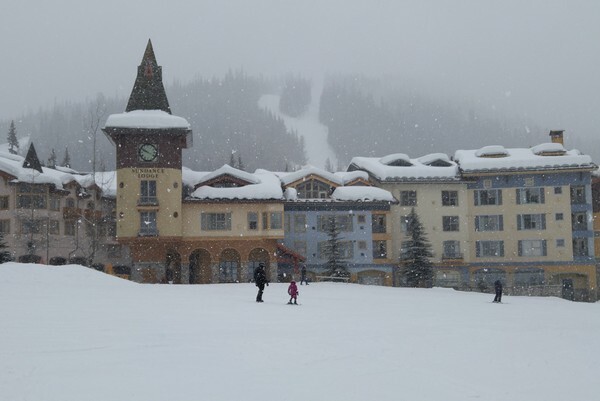 A few weeks ago, we returned to one of our favourite alpine villages in Canada – Sun Peaks Resort. The last time we visited Sun Peaks, back in 2014, Braydon was only 2 years old and Connor was just a few months old. Times have certainly changed since that last visit! Sun Peaks Resort is located in British Columbia’s Interior, about 45 minutes north of Kamloops and 5 hours drive from Vancouver. It boasts Canada’s second largest ski area, next to Whistler-Blackcomb, and is known for its light, dry powder and sunny blue skies. We love its European-style alpine village and laid-back family vibe. It’s only 5 hours from Vancouver, yet we feel like we’re in a completely different part of the country. 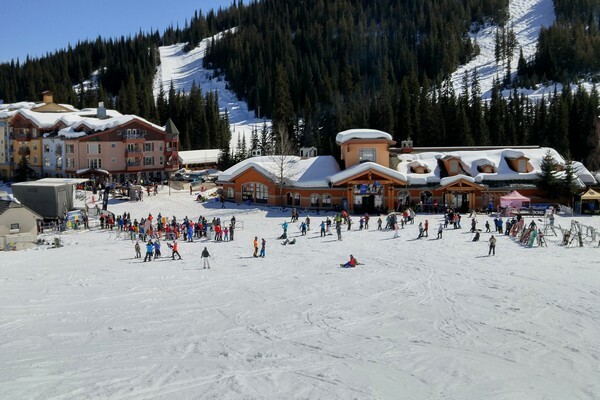 We visited Sun Peaks over the Easter holiday weekend for a few reasons. First, it allowed us to have an extended weekend without using our vacation days (this is one of the ways we’re able to travel more). The drive is only 5 hours from Vancouver, so we hit the road early and arrived at Sun Peaks by mid-afternoon. It’s far enough away that you feel like you’re on a road trip, but close enough that you don’t need to lose a full day traveling. 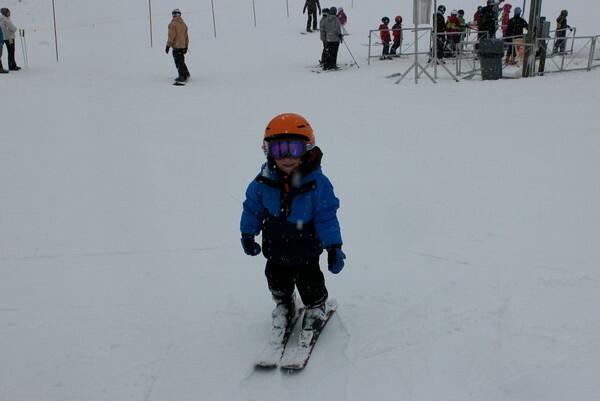 Second, we wanted to put Braydon in ski lessons for the first time and thought it would be best to do this later in the ski season, when the weather is warmer. Teaching our boys to ski is important, to us. We love playing in the mountains and we want to pass this love on to our boys. But, of course, this will only happen if they embrace the outdoors. If you’ve read this blog over the past few years, you’ll know that we try to visit at least 3 ski resorts every year, so we’re doing our best to get them comfortable with the ski culture. Braydon has always been a very cautious boy. He’s not the adventurous type that gets himself lost or into trouble. He likes to play sports and he’s become much more social over the past year, but he can still be quite shy at times, so we had low expectations about him embracing the private ski lessons. In fact, we didn’t think he would last the full 2 hour session. The main goal for this winter vacation was to get Braydon on a pair of skis and have him go down the bunny hill a few times. Even if he only lasted 20 minutes per lesson, we felt that would be a big win for him. At this stage of his development, we just want him to feel comfortable wearing skis. One of our biggest fears is that he would hate skiing without really giving it a fair shake. The last thing we want is for him to have a bad experience and then fight us every time we want to go to the mountain (which will be quite often throughout his childhood). That’s actually a big reason why we waited until later in the season, when the climate was much warmer. He doesn’t like being cold, he’s more of a beach boy, so we didn’t want to introduce him to a new sport when it’s freezing cold outside. Rather then have Braydon get frustrated with us telling him what to do, we decided it was best to enroll him in ski lessons. 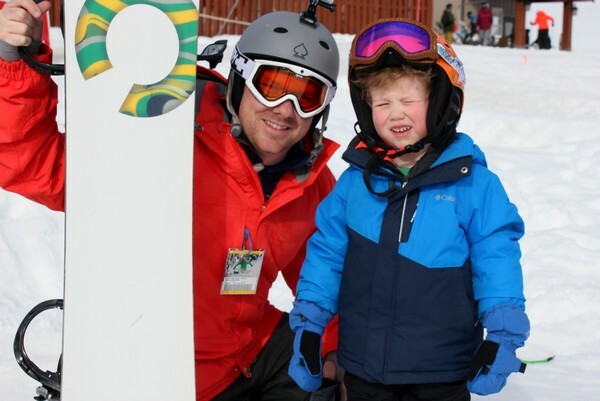 We really like the variety of family ski programs at Sun Peaks, so we thought the Sun Tots program would be a great introduction for him. The Sun Tots program at Sun Peaks is designed for children between the ages of 3-7 years old. 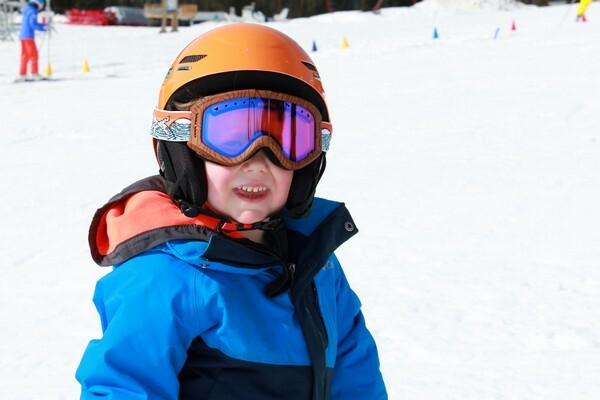 Each child gets a private one-on-one lesson with a ski instructor for 1, 2 or 3 hour sessions. We picked up Braydon’s skis and boots at Elevation Ski Shop, located on the retail level of the Sun Peaks Grand Hotel. He was also provided a helmet with his equipment rentals. We met his ski instructor, Olivia, at the Sundance Kids Centre, located beside the Village Day Lodge at the base of the mountain. In fact, pretty much everything is located near the Village Day Lodge, which is actually quite convenient. We took his brother, Connor, to the Sundance Kids Centre to play for a couple hours so we could watch Braydon and cheer him on. Braydon’s lesson began at 9:00 AM. It was a beautiful warm, sunny morning. We could not have asked for better ‘first time skiing’ conditions. Braydon and Olivia spent the first 30 minutes in the dedicated toddler section near the child care facility. As you can see from the above photos, it’s a relatively flat section with a short magic carpet that transports the little tots back to the top of the slope. It’s not really a hill, it’s more like a gradual slope. At the bottom of the slope was a castle of large, soft cushions that the youngsters would ski towards. As you can see from the video below, they made for a soft landing. Having trouble watching the video? Click to watch on YouTube. We were so impressed by Braydon’s willingness to give skiing a chance. He listened to his instructor and got the hang of it pretty quickly. Within 10 minutes he was shooting down the slope without falling. And, more importantly, he was having fun. Olivia felt that Braydon was ready to take on the bigger kids section near the Sunburst Express chairlift. They quickly developed a great connection and it was clear that he was having fun with her. Because she had build trust with him, she was able to gradually push his comfort zone and get him skiing on the bigger hill. I’m almost certain he would not have done the same for us. In fact, we probably wouldn’t have even attempted the bigger hill with him, so we’re glad he was learning with an instructor that pushed him to do more. Look at him go! This is only 30 minutes after putting skis on for the very first time! We couldn’t believe how quickly he learned! We began the morning with the expectation that he would probably only last 20 minutes. Within an hour he’s ripping down the bunny hill like a pro! I’m smiling as I type these words. He completely blew our minds! After this first lesson he was so proud of himself. He was beaming with confidence and was so excited to share his success with us. It was a special moment. One we’ll always remember. On the second day of lessons, we woke up to a blanket of fresh snow on the mountain and it continued to snow quite heavily for a few hours. It was the complete opposite to the bluebird day we had the day before. The soft fresh snow made for great learning conditions. It wasn’t very cold and the falling snow transformed the mountain into a winter wonderland. We really lucked out with the weather. We were happy to learn that his instructor was going to be Olivia again. When possible, the staff try to keep the same instructor when there are multiple days of lessons. This is a great policy, especially when trust and comfort play such a big role in the success of the lesson. Olivia suggested Braydon try the bigger hill that morning. She pointed to the rope tow and a much steeper section of the hill. Our jaws dropped when we looked at the size of the hill she was pointing to. This was a big step up from the day before and it looked to be too big for him. But, we put our trust in Olivia and acted like it was no big deal. We likely would not have attempted that section if it was us teaching him. It was good that we were not the ones calling the shots because Braydon picked up right where he left off. He went flying down the hill like a champ! After his two hour lesson we said goodbye to Olivia. Two days was the perfect introduction to skiing. It was enough to get him comfortable but not too much that it would push him in the wrong direction. 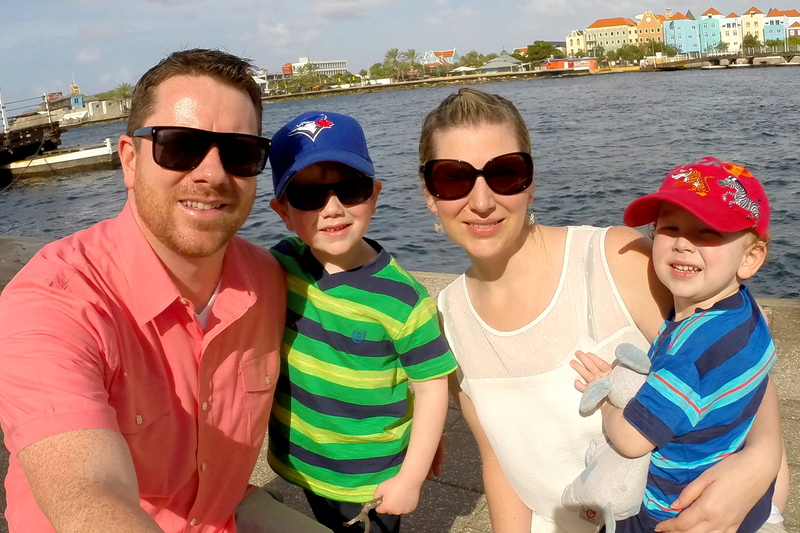 Our experience with Sun Tots was a huge success. In just a few hours, Braydon went from never trying on a pair of skis to going up the rope tow all by himself. Well, he made it half way up the rope tow before he fell, but that still counts! He was able to ski down the hill without falling and he even tried a couple little jumps. His instructor Olivia said he was probably ready for the chair lift, but we decided to leave on a high note and save that for next season! He was so proud of himself. And we are still blown away by how great he did. It was a fantastic experience for everyone. 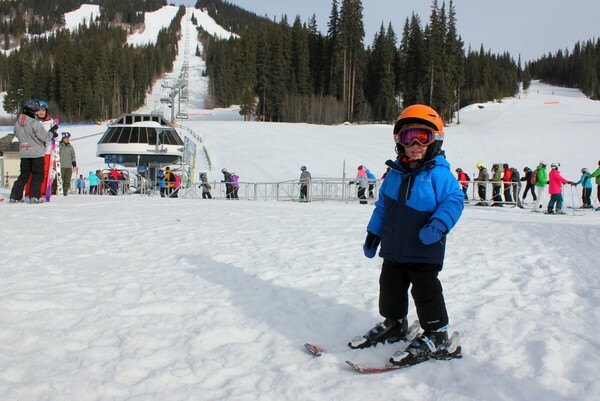 If you are thinking about putting your little ones on skis for the first time, we would recommend you take a good look at Sun Peaks Resort and their Sun Tots program. We were impressed with his instructor and the services provided. And, most importantly, we left with a little boy asking when he can go skiing again. WIN! The Sun Tots program is the perfect way to learn to ski at Sun Peaks. You can choose from 1, 2 or 3 hour lessons. All Sun Tots lessons provide a one-to-one student to instructor ratio. Children 5 years and under ski free. Equipment rentals can be added to any lesson. Visit the Sun Peaks website for more info. We rented Braydon’s ski equipment from Elevation Ski Shop. The store is located on the retail level of the Sun Peaks Grand Hotel. We were able to keep the skis, boots and helmet overnight, which was very convenient. While Braydon was learning to ski, we put his brother Connor in child care at the Sundance Kids Centre. Connor spent 2 hours at the facility. This allowed us to go snowboarding without the kids, which was a big win. Both of our boys use Columbia winter gear. In fact, our entire family has Columbia winter gear. Braydon has the boy’s Evo Fly jacket (size XXS) along with Columbia snow pants. We brought two pairs of gloves/mittens for each boy, which ended up being a great idea because one pair seemed to always be wet. We weren’t sure about goggles but we were glad we brought a pair – he needed them for the bright sun and the heavy snowfall. We stayed at the iconic Coast Sundance Lodge. It’s located within steps of the two main chair lifts (pictured above) and offers the best ski-in/ski-out experience in all of Sun Peaks. There are restaurants, cafes and shopping located directly in the hotel and our room was equipped with a stocked kitchen that included a fridge, stove and microwave. Disclosure: our trip to Sun Peaks was in partnership with Sun Peaks Tourism. We received complimentary Private Sun Tots Lessons. As always, all expressed opinions are entirely our own. Great to hear that his first ski lesson went so well … this sport is an amazing one, and I hope he grows to love it as much as you have! Learning to ski is so much easier as a kid! Good on Braydon for giving it a go and having such a fun time! Great Post….Wow….Such a amazing place and some captured pictures are awesome. That place looks beautiful! We got our 2 boys skiing recently in Romania, it was ultra cheap and they skiid whenever they felt like it riht through the ski season. I’m with you on it being important to us that they learn, it’s a good skill to have and a social door opener. One loved it, the other was a little more thoughtful and almost-reluctant. He can, but I’m not sure as yet that he really wants, to ski. Great to hear that his first so well … this sport is an awesome one, and I expect he spring to love it as much as you have…..
Learning to ski is not easier as a kid! Good on Braydon for giving it a go and having such a fun time!